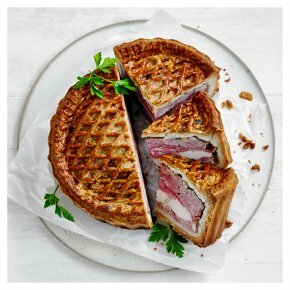 The classic combination of​ layered pieces of pork, chicken​ and ham in a hot water crust pastry​ case with a closed lattice lid. The pie is made to a 25 year old recipe by master pie makers in Leicestershire, and only include the finest ingredients, including herb marinated chicken, British pork with a rich pork jelly stock made the traditional way, and quality flour and lard for wonderfully rich, crisp pastry. Treat family and friends to this luxury pie, a superb addition to any buffet table, picnic or party. Serve with salads, cheese and chutneys.